The events of the 11th of September 2001 revealed most dramatically that globalization has a shadow. While large sections of the world’s population enjoy the perceived benefits of globalization, others seek to utilize globalization for their own politically violent purposes. If 9/11 demonstrated anything, it is that globalization can as readily facilitate violence and insecurity as it can produce stability, prosperity and political order. This edited volume offers important new methodological and multi-disciplinary insights into the study of globalization and political violence. 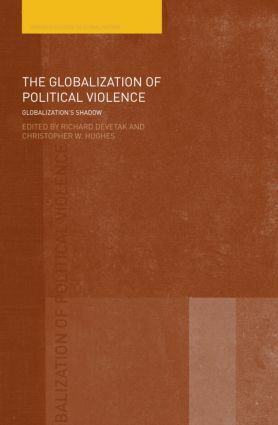 It brings together studies from various disciplines in order to address the precise nature of the relationship between globalization and political violence as it seeks to offer new theoretical and empirical understandings of the types of actors involved in political violence, either as perpetrators or victims. Examples of the studies include the changing character of state militaries and state-to-state conflict under globalization, the emergence of ‘new wars’ fuelled by globalization, the role of state militaries in intervention, new forms of violence directed by states against refugees and anti-globalization protesters, the role of terrorist actors post-9/11, networks for the proliferation of weapons of mass destruction and the rise of private military firms amongst others. The Globalization of Political Violence will be of interest to students and researchers of politics, international relations, security studies and international political economy.